Wonderful World of Bugs homeschool science course is divided into four units that explore why we should study bugs, what exactly is a bug, the life cycles of butterflies and moths, and the practice of nature journaling. It includes hands-on assignments and also written assignments for families who choose not to bring nature indoors! Go to Class Lessons and download the lesson plan and lessons. Start with the Day 1 assignment. Follow the instructions each day on the lesson plan and check them off when completed. Wonderful World of Bugs homeschool science course is divided into four units that explore why we should study bugs, what exactly is a bug, the life cycles of butterflies and moths, and the practice of nature journaling. Week One: Why Study Bugs? Week Two: But What Is a Bug? Welcome to the wonderful world of bugs! This special class is designed to be done together as a family. Students should NOT try any of the experiments or activities included without a parent’s permission and direct supervision. This course was prepared by several different authors, whose names you’ll find on the units they submitted. Following each unit are activities and assignments you can enjoy (either in addition to or as an alternative to the bug collecting and studying suggested in these units). Have fun! Entomophobia, insectophobia, and arachnophobia are the fear of bugs, insects, and spiders. What better way to conquer such fears than to study and discover the wonders inherent in vermin that slither, scamper, crawl, and climb? How does one get into the study of bugs? Well, in our family it all began one day, several years ago, when we heard a scream from the basement and ran downstairs to find one family member in slight terror over the creepiest bug we’d ever seen hanging by its pincers from the ceiling ductwork. Needless to say, a child was sent, at a high rate of speed (it’s okay to run in the house when there’s a bug to catch), to the kitchen to find a container suitable for catching this vermin. We managed to catch the bug, about four inches long, which looked like a cross between a scorpion and a cockroach. This bug had large pincer-claw looking things in the front, long antennae, a very long tail, and to make matters worse, smelled awful, just like sniffing a bottle of vinegar. We had no clue what this bug was, but we were determined to find out. After a little research in our insect field guide, we determined that this scarylooking bug was something called a vinegarroon, or whip scorpion (Mastigoproctus giganteus). Now what were we to do? After a family meeting, we decided that this critter was destined to become a family pet. We went out to the garage and rounded up an aquarium and some reptile sand (we actually have several spare aquariums at any given time since one never knows when a bug, snake, lizard, or some other living thing might join the family—we like to be prepared), a small hollowed-out log for shelter, and a small water dish. After fixing up a nice home, our vinegarroon was placed inside and the aquarium located in the kitchen. Were we in for a surprise. This bug wandered around making the most fascinating tracks. What an interesting thing to watch. Over the next two-and-a-half years, this vinegarroon was a great pet. It ate crickets, enjoyed plunging itself, head first, into its water dish and remaining there for hours, and wandered around leaving tracks. Watching it catch the crickets we provided for food was often a family event. It could grab a cricket with its pincers in no time flat, eat it, and then clean up the mess by moving the debris and leveling the sand with those same pincers. We also found that if it was frightened, it would shoot that vinegar-smelling stuff out of its long tail and pretty much stink up the aquarium. After Vinny finally died, we had another opportunity to catch a vinegarroon and, again, this second one lived about two-and-a-half years. A very cool pet indeed. 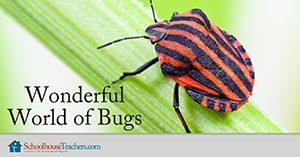 This special class Wonderful World of Bugs homeschool science course is designed to be done together as a family. Students should NOT try any of the experiments or activities included without a parent’s permission and direct supervision. Would you like to tell others about this Wonderful World of Bugs Homeschool Science Course?